Isabel had made a huge decision to call off her wedding one week before the nuptials. Career minded and independent, the thought of giving up her lucrative career in finance for life on a farm is unprecedented. She does the only sensible thing….calling it off as she knows she won’t be happy. Her ex-fiance suggests that she take their honeymoon tickets to Paris to clear her head and figure out where her life is going. As she stand on the balcony of the elite Hotel Crillon, admiring the city of lights, she realizes she is locked out on her terrace. Thankfully the guest next door, Alec, is able to contact the concierge desk to let her back in. As a thank you, Isabel offers to take Alec out for breakfast the next day. Alec, a French children’s illustrator, is also in Paris nursing a broken heart. Isabel is determined to enjoy her time in Paris, and perhaps Alec will join her as a friend. After a chance encounter with a fortune teller and a close call with a taxi, she starts to question everything she thought was important. This book reminded me of a Hallmark or Lifetime channel chick-flick. It had all the cliches (bordering on sappy) and that whole whirl wind romance feel to it. Normally I am not a fan of cliche romances as I prefer a more brooding story thick with angst for the main characters but this book sounded so charming…and honestly who can resist Paris at Christmas time? So I decided to give it a go. It’s hard not to love a book that’s all glitz and glamour from the very beginning…..swanky Paris hotel in a exclusive and romantic region of Paris, a very Vogue wardrobe, a rich young executive, meets a dashing yet snarky illustrator? This book screamed fantasy to me and it’s nice to jump into a fairy tale, fantasy romance novel! This isn’t the kind of book that had a lot of character depth or substance, it’s basically just a fun romantic story which is just what I needed. It was easy to read and get into. I didn’t care that the characters weren’t as fully formed as I had hoped because the fairy tale romance feel was so strong and enjoyable that I really could care less about the characters ‘back story’ or development. As a reader I found myself invested enough in the characters to care what happened to them, but I felt more interested in reading all the descriptions of the city and the romance itself. For me, this was one of those stories that a lot of women wish could happen to them. They are able to fly away from everyday life for at least a couple of weeks……fly to some exotic city and meet a dashing and handsome man and fall desperately in love with them in a whirl wind romance….if this is the romance you are looking for then you will love this book. 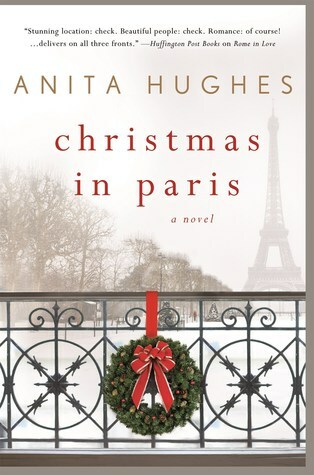 I loved the cozy Christmas feel to this story and really Paris is the perfect setting for a story like this. While I would normally want something ‘more’ from a story like this, I really enjoyed this nice little romantic treat! I see that a lot of Hughes’s books are romances set in different exotic/romantic locations throughout the world and the next time I am craving a simple, romantic fairy tale romance I am going to pick up another of her books!